has been designing and implementing large-scale service provider and enterprise networks as well as teaching and writing books about advanced technologies since 1990. He’s author of several Cisco Press books, prolific blogger and writer, occasional consultant, and author of a series of highly successful webinars. His current focus includes large-scale data centers and cloud deployments, software defined networking (SDN) and data centers (SDDC), and network function virtualization (NFV). ipSpace.net is a vendor-independent blog and web site focusing on scalable physical or virtual architectures, emerging internetworking technologies, and stable real-life solutions. 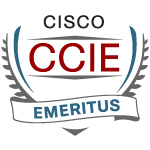 Ivan Pepelnjak, CCIE No. 1354 Emeritus, has built his first proprietary WAN network in early 1980's. He has been designing, installing, troubleshooting, and operating large service provider and enterprise WAN and LAN networks since 1990, and server as chief technology advisor at NIL Data Communications for well over a decade. In his role as technical director of NIL Data Communications, Ivan focused exclusively on large-scale IP networks, became one of the early Cisco Certified Internetworking Experts (CCIE) and one of the first Cisco-certified instructors. His extensive knowledge helped service providers, such as British Telecom, Deutsche Telekom, France Telecom, Global One, Telia and SITA deploy large-scale state-of-the art IP or MPLS networks. Large corporations benefiting from his experience include equipment manufacturers and integrators, such as Cisco Systems, Digital, Hewlett Packard, IBM, Unisys, as well as banks (Dresdner Bank in Germany) and petroleum industry companies (Statoil in Norway). He was also able to transform the hands-on experience gained in consulting projects into an educational framework when he was one of the architects of Cisco Systems' Service Provider curriculum and the lead developer of several Service Provider-focused courses covering Border Gateway Protocol (BGP), Multi-protocol Label Switching (MPLS) and IP Quality of Service. These days, you'll likely find Ivan solving interesting networking, SDN- or web-related challenges or you might find him hiking, mountain-biking or rock-climbing somewhere high in the European Alps. No warranty whatsoever is made that any of the posts are accurate. There is absolutely no assurance (apart from author’s professional integrity) that any statement contained in a post is true, correct or precise. Even if a statement made in the post is accurate, it may only be accurate in the context of a specific software release running on specific hardware platform made by a certain vendor.